SEATTLE - Oct. 23, 2018 - PRLog -- lan Delaney, an insider family member to the Khashoggi family, has written an International Political Thriller, The True Story of Riad Khashoggi Rebel Sheik. Riad Khashoggi is the late brother of Jamal Khashoggi. 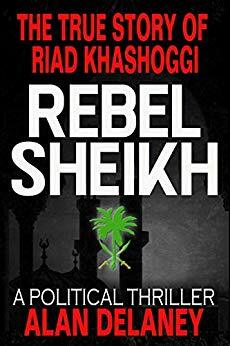 The True Story of Riad Khashoggi Rebel Sheik. This fascinating and thrilling story tells of the ultimate insider of the Saudi Arabian high society, the political insider Saudi scene. A world to which ordinary mortals virtually never have access—to elegant salons, immeasurable might, fairytale-like wealth, and brutal politics...along with the Secret Service, CIA, politicians, princes, kings and corruption. It's a mysterious world behind opaque veils that are rarely, if ever, lifted. Sheikh Riad Khashoggi was born, not only into one of the oldest, but also into one of the most powerful families in Arabia. His family, dating back 800 years, produced kings, sultans, muftis, ministers, scholars (including the first female nuclear physicist), and generals. This captivating story starts off with his grandfather, Hamza, the mighty Sheikh of the Khashoggi family and a major figure in Medina, who had dealings with Lawrence of Arabia leading up to the fascinating and thrilling story that made Sheikh Riad into one of the most powerful players in the Saudi scene until he, himself, became the target of the special interests. His perception of justice ultimately leads to the assassination of King Faisal and his best friend, the Foreign Minister, along with the overthrow of his close friend, the head of the Saudi Arabian CIA and brother-in-law of the king. This view of life and attitude didn't make him any friends. When he emerged as a freedom fighter who made history, not only for his actions but by writing the Freedom Manifesto… the hunter, became the hunted.